A gift of our yummy chocolate squares will cheer up your clients, friends and guests! 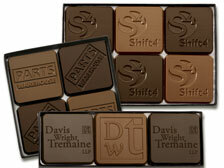 We offer to customize pieces of milk and dark chocolate, engraving them with your logo, message or image. Each piece measures 2” x 2”. 8 of these assorted squares are packed in a customized gift box. The chocolate squares and gift box are customized for free.